Each year, the Association of Medical Illustrators has a juried Salon at its national conference (this year in Baltimore, at the end of July).  Unlike most "art" competitions, the judging criteria are not just based upon the aesthetics of the illustration -- instead, the illustrations are most heavily judged by how well the illustrations communicate a message and upon the illustrations' anatomical and medical accuracy. MediVisuals was honored once again this year to receive the Award of Excellence and the Award of Merit in Medical Legal illustration. 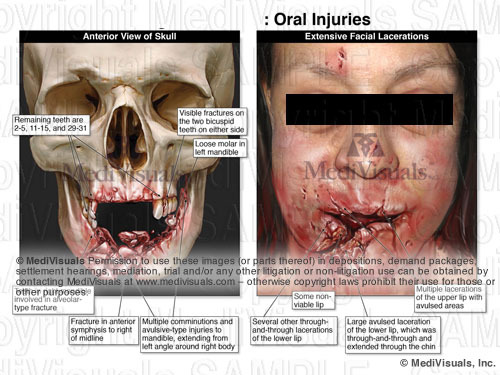 The below illustration, created primarily by Paul Gross, MS, received the Award of Excellence for effectively demonstrating a surgical procedure to repair severe facial lacerations resulting from a dog bite. The illustrations were created for Susan M. Bourque of Parker & Scheer, LLC in Boston. The exhibit assisted Parker & Scheer in obtaining a substantial recovery on behalf of the client. 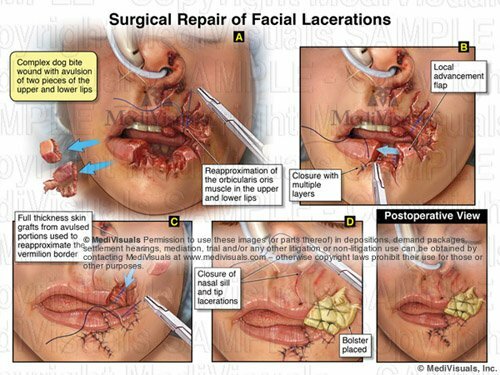 The Association's Award of Merit was bestowed to Cynthia Yoon, MS.BMC, the primary illustrator for a series of three exhibits demonstrating severe facial injuries and surgical repairs resulting from an awning pole from a passing camper flying through the windshield of a vehicle. The exhibits were developed for William Cunningham of the Burns, Cunningham & Mackey firm in Mobile, Alabama. The first exhibit shows the initial fractures and external injuries. The second exhibit demonstrates the chronic left jaw dislocation that ensued after the initial ORIF of the jaw had healed. 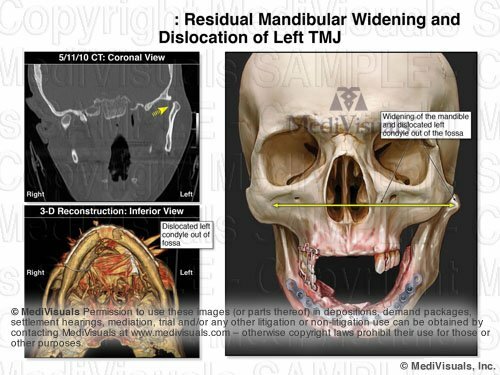 The third exhibit highlights the surgical procedure the plaintiff underwent to correct the malunion of the mandible and the left jaw dislocation. Bob Shepherd, MS, developed the concepts for the illustrations and worked with the illustrators and counsel to help ensure the illustrations met the desired objectives.